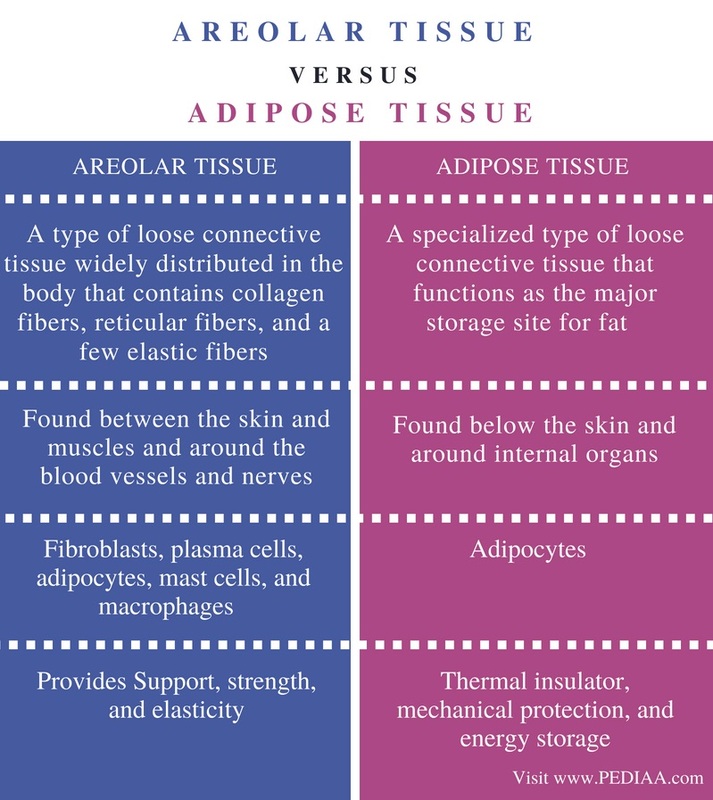 The main difference between areolar and adipose tissue is that the areolar tissue fills the space between organs, supporting internal organs whereas the adipose tissue serves as the fat reservoir and thermal insulator. Furthermore, areolar tissue occurs between the skin and muscles and around blood vessels and nerves while adipose tissue occurs between internal organs. Areolar and adipose tissue are two types of loose connective tissue that occur between the internal structures of the body, providing a medium for transport and structural support. Areolar tissue is one of the commonest forms of loose connective tissue. It occurs in both dermis and the subcutaneous layers of the skin. It attaches the skin to the beneath muscles. It also occurs around mucous membranes, blood vessels, and nerves. Many cells are scattered throughout the fiber meshwork of the areolar tissue. These cells are fibroblasts, plasma cells, adipocytes, mast cells, and macrophages. The key functions of the areolar tissue are support, strength, and elasticity. Adipose tissue is the form of loose connective tissue that stores fat in the body in the form of triglycerides. It forms a thick layer under the skin, around the heart, kidneys, joints, and buttock. 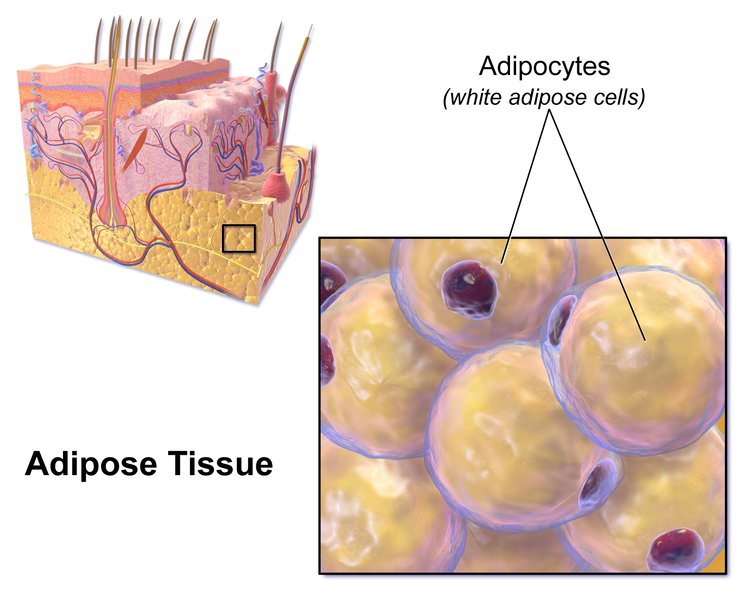 The most prominent types of cells in the adipose tissue are the adipocytes. Each adipocyte cell is filled with a single, large droplet of fat. The cytoplasm and the nucleus of the cell are pushed to the edges as fat occupies most of its space. The main function of the adipose tissue is to serve as an insulating layer that helps to reduce the heat loss through the skin. It also provides mechanical protection to the internal organs. Adipose tissue is an energy source as it stores fat. Areolar and adipose tissue are two types of loose connective tissue, the most common type of connective tissue in vertebrates. They consist of cells dispersed in an extracellular matrix. 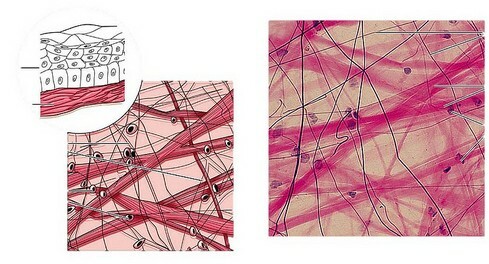 The three types of fibers found in these tissues are collagen fibers, elastic fibers, and reticular fibers. Both help to hold internal organs in place and attach epithelial tissue to the underlying tissue. Areolar tissue fills the spaces between internal organs and facilitates transportation while adipose tissue serves as a fat reservoir and heat insulator. Both areolar and adipose tissues are loose connective tissues. Areolar tissue mainly consists of fibroblasts whereas adipose tissue consists of adipocytes. The main difference between areolar and adipose tissue is the structure and function.